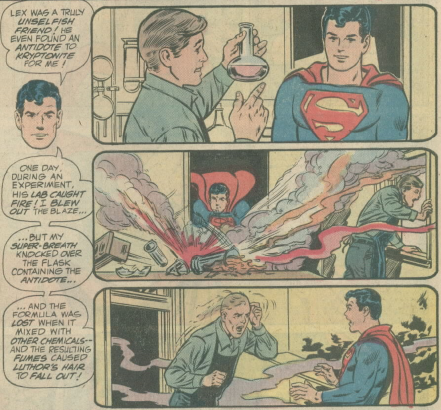 Boldman, Saviuk and Schaffenberger share the last in-continuity pre-Crisis Superman story in Action 582 (Aug. 86). 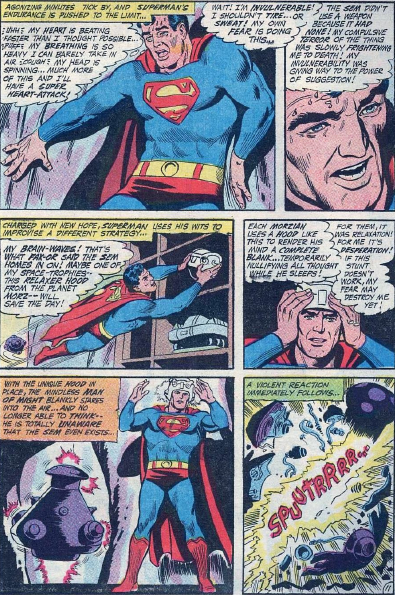 After having a number of vivid dreams about Jor-El and Lara, Superman discovers that there are two other, distinct, brain-waves in his head. He believes these two be the minds of his parents, somehow preserved within him. 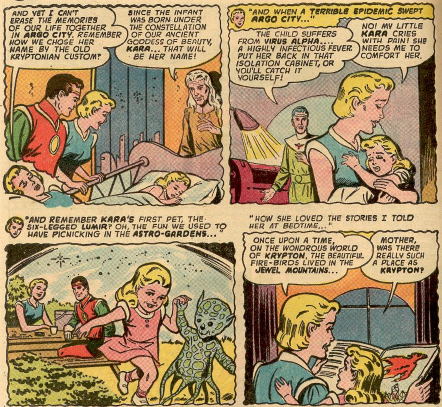 He creates clone bodies for them, and is thrilled when the brain-waves transfer from his mind into the bodies, animating them and bringing his parents back to life. 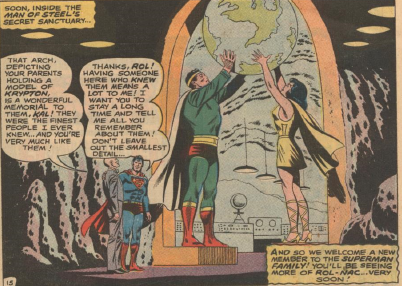 He provides them with human identities, and shows them around Metropolis, and Earth, while helping them adjust to their new powers. 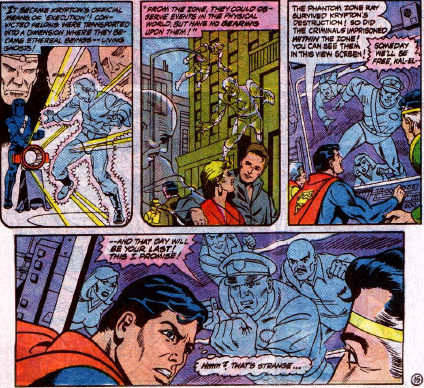 Superman brings them to his Fortress of Solitude, but when he shows them the Phantom Zone viewer, he is surprised that the villains, General Zod, Jax-Ur, Professor Vakox and Faora, are cursing him, and not his father, the man who invented the Zone and sent many of them there. And, indeed, his parents are not his real parents. 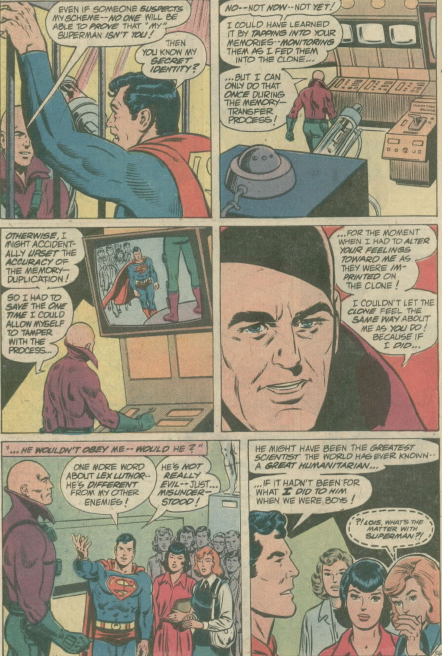 How the Phantom Zone villains could tell is not clear, but once Superman suspects them, they drop the act and try to kill him. 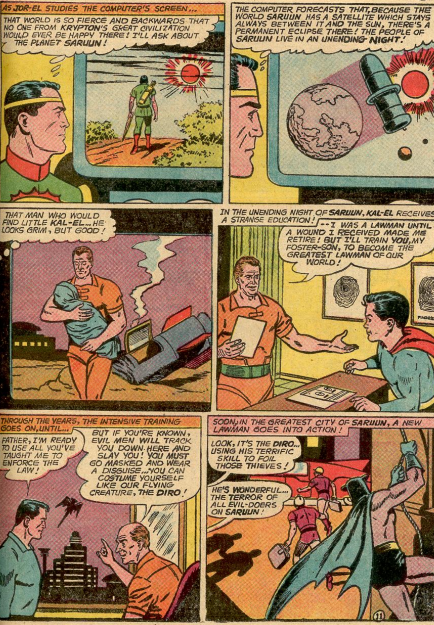 They put him in a rocket and fire him into space. 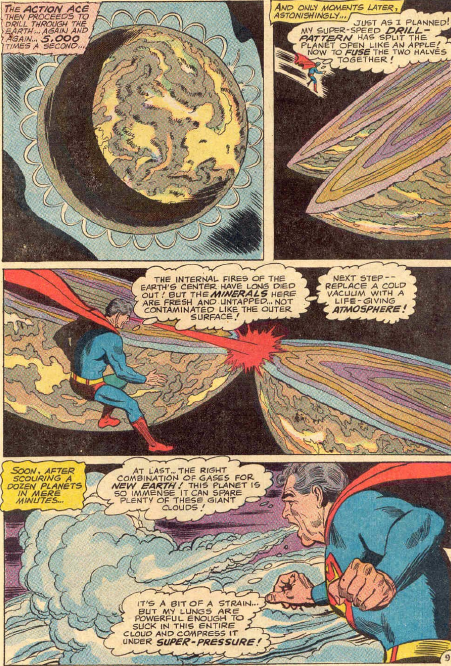 Superman escapes from the rocket, but spots a familiar ship orbiting Earth. It belongs to Rokk and Sorban, the compulsive gamblers from Ventura. 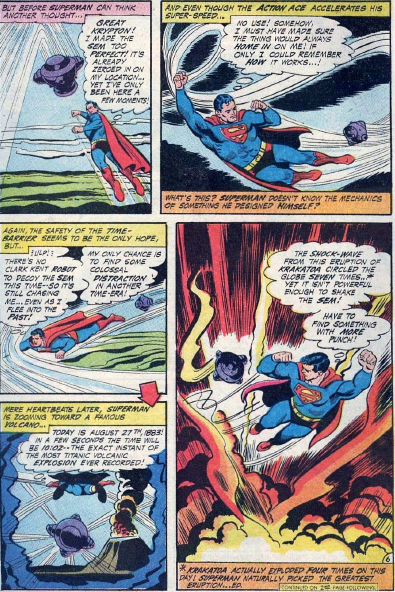 Frequent guests in Superman’s own comic, and World’s Finest, back in the 60s, this is their first, and only, appearance in Action. 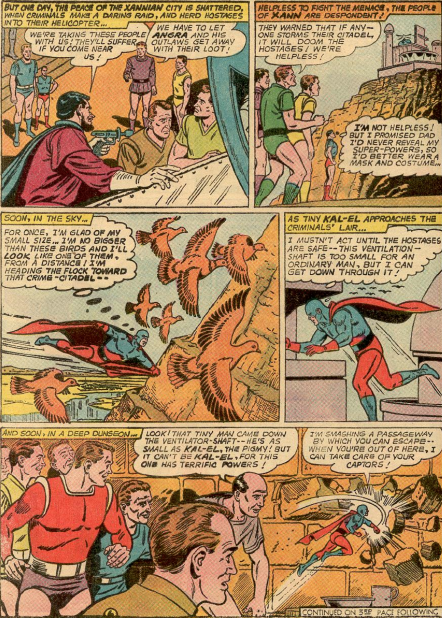 They used some “free-floating” consciousnesses for Jor-El and Lara, but the bet at the core was whether Superman would be angry enough to kill the phonies, or not. 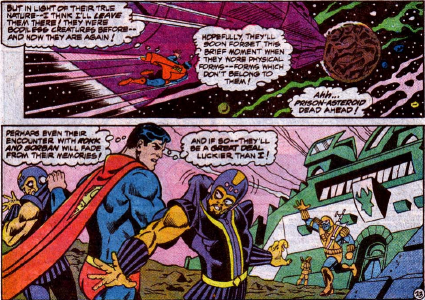 The story ends as Superman takes Rokk and Sorban to the “prison planet,” (Takron-Galtos?) 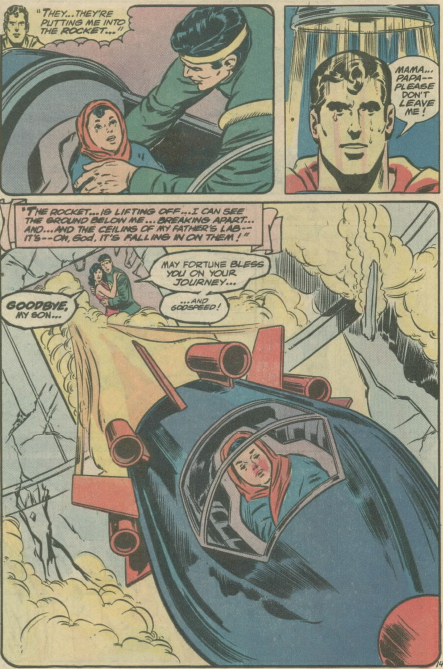 Superman shows little concern about what the phony Jor-El and Lara are up to, loose on Earth, with all their powers. 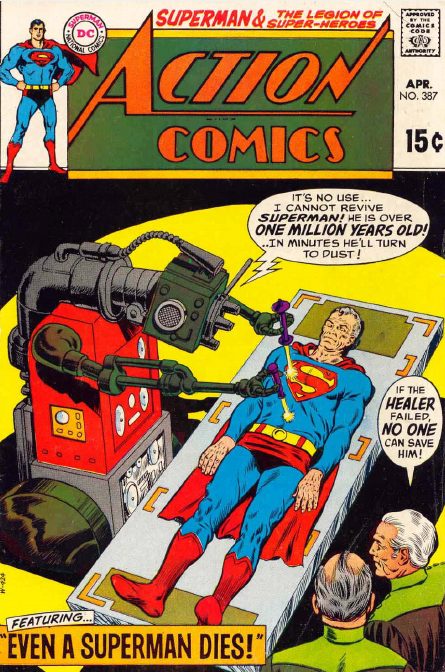 But the gamblers assure Superman that they will return to their non-corporeal state. 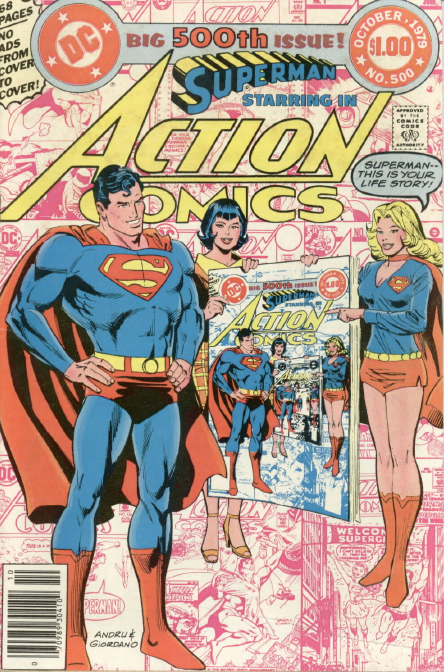 Action 500 (Oct. 79) is an oversize special, which does a good job of providing a fairly comprehensive story of Superman. 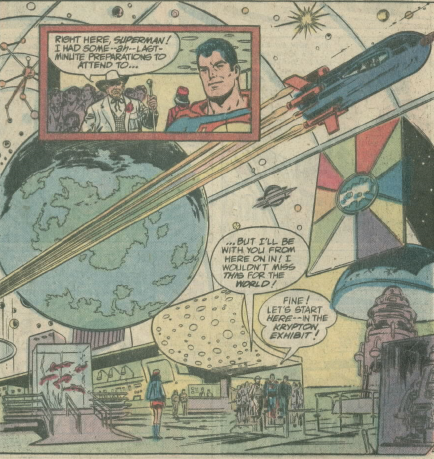 Bates, Swan and Chiaramonte choose a big public tour of a new Superman pavilion as the framing device for the tale. The various rooms give focus to different parts of the story. 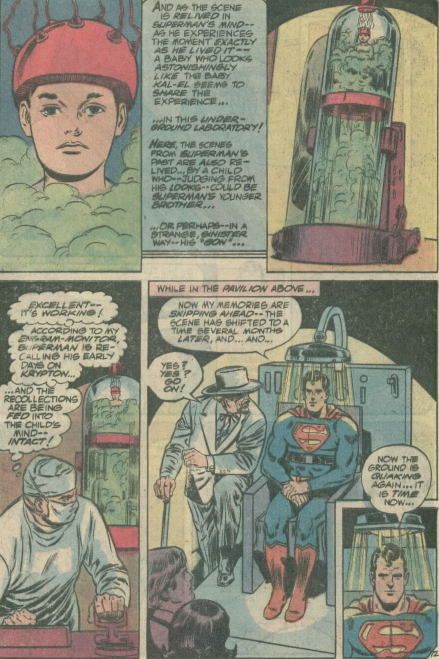 There is also a machine at the exposition which draws out Superman’s memories, so that people can enjoy his grief as he recalls Jor-El and Lara, and his early life on Krypton. 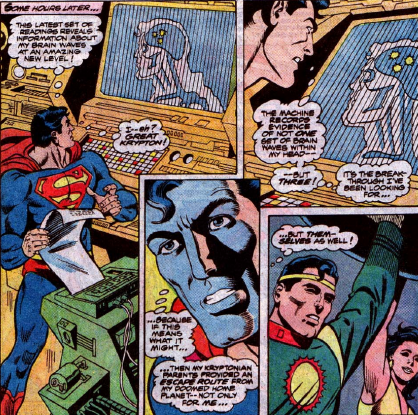 But a mystery villain is making use of the device, channeling the memories into a Superman duplicate he is creating. 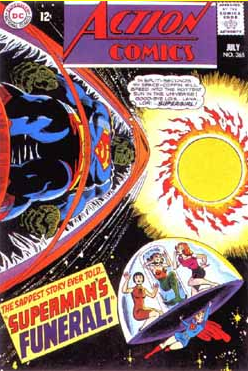 The creation of the Phantom Zone is referenced, as well as Krypto on a test rocket. 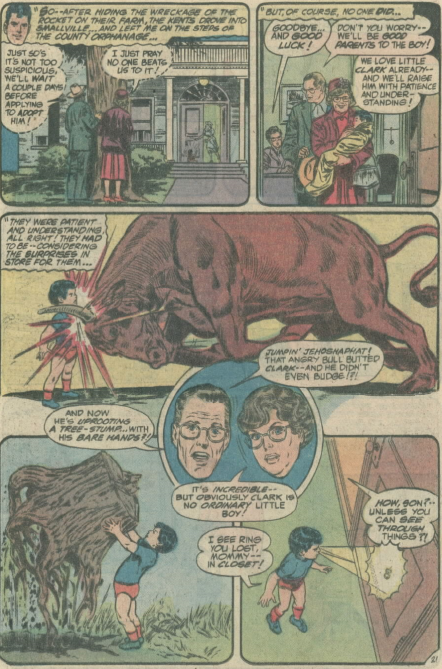 The Kents are shown, finding the boy and raising him, both through his Superbaby phase, and later Superboy. 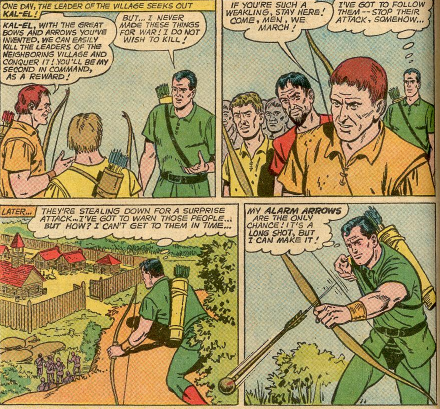 The story often uses exact swipes of scenes and images from earlier stories. 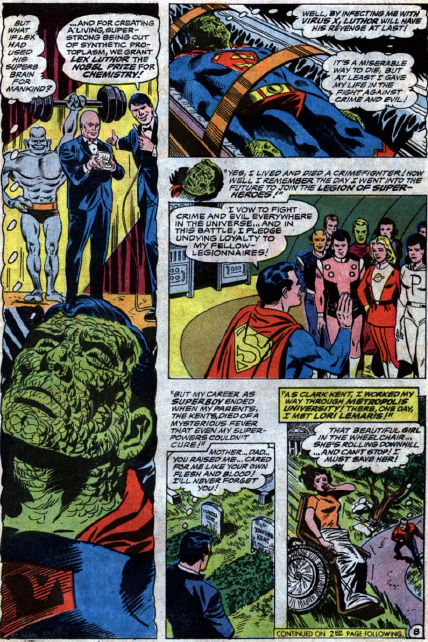 The death of Pa Kent duplicates the first telling of the event. 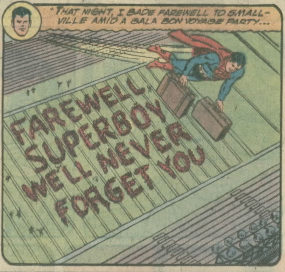 As does the farewell message from the people of Smallville. 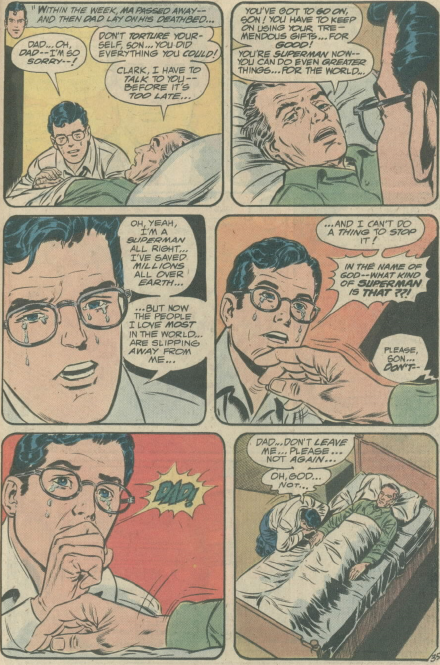 Clark Kent’s life in Metropolis is shown, getting the job from Perry White at the Daily Planet, and working with Lois Lane and Jimmy Olsen. 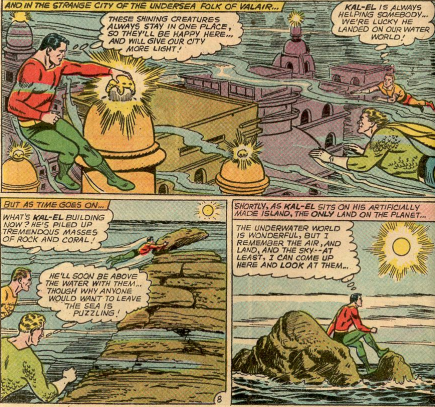 Morgan Edge’s takeover is related, with Steve Lombard making an appearance. 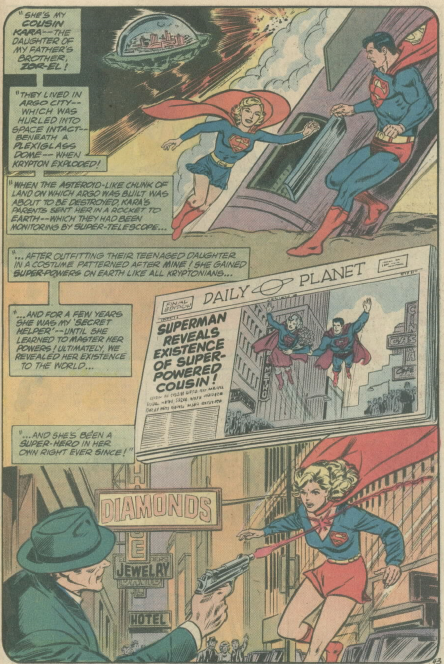 Supergirl gets her own room in the pavilion, and a montage of her career. Other aspects are really downplayed. 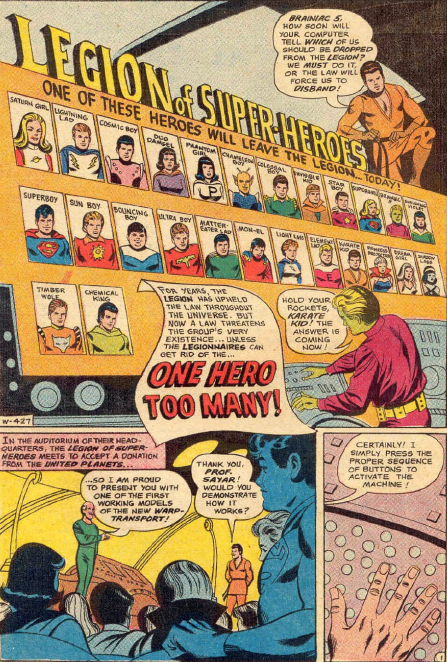 The Legion of Super-Heroes appear, in their current line-up, in the Superboy room, but are not talked about. 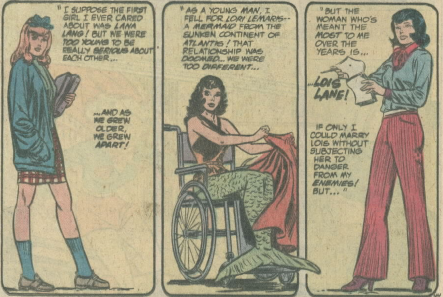 Still, Lori Lemaris does make it into the triptych of his loves, along with Lois and Lana. The villain room is the most notable – for its absences. 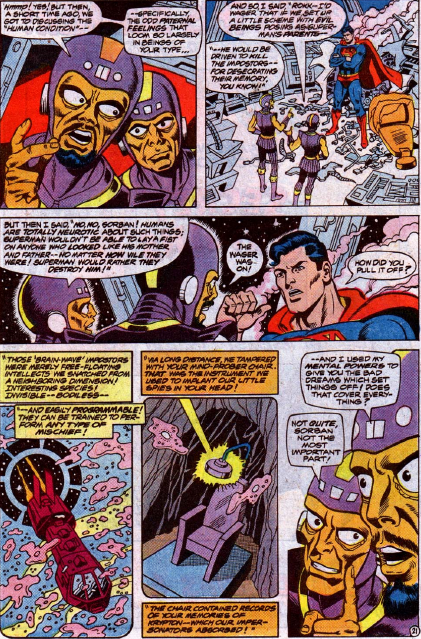 Aside from Luthor and Brainiac, only the Toyman and Parasite are shown. 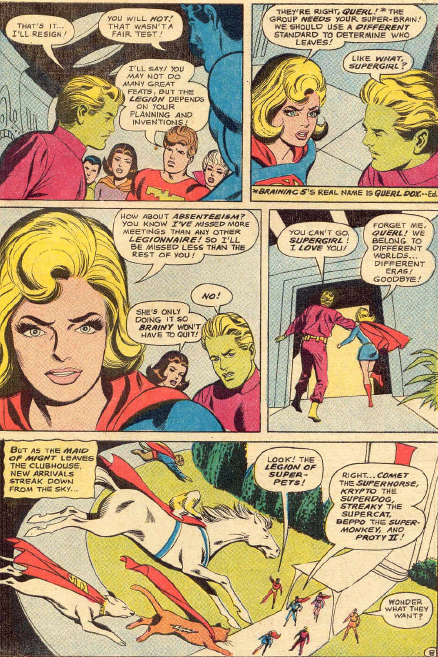 Brainiac has his story told in depth, as it relates to Kandor. 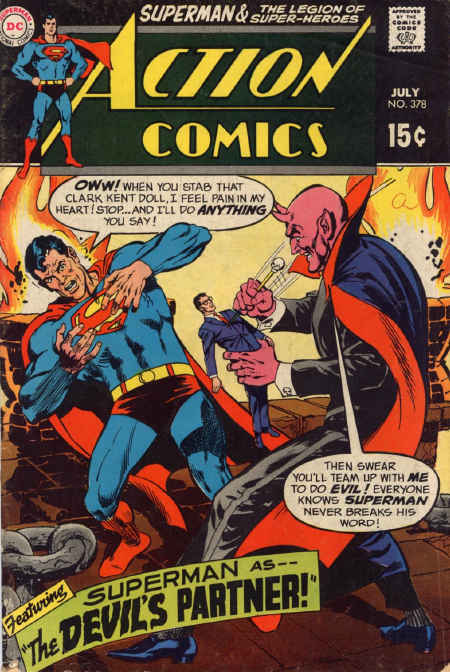 The mystery villain turns out to be Lex Luthor, which is not that much of a surprise. 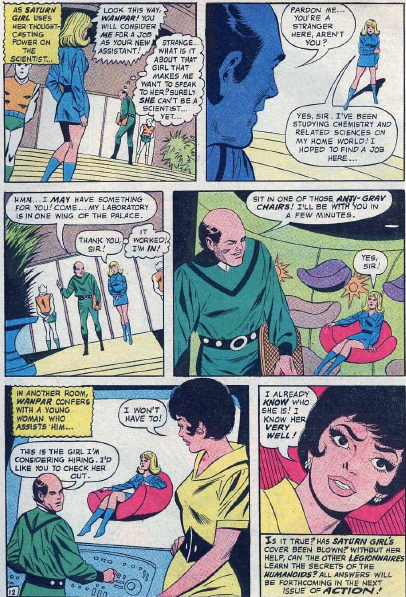 And the duplicate gives himself away when he relates Luthor’s origin from Luthor’s own, very slanted, view. As a story, this leaves something to be desired. 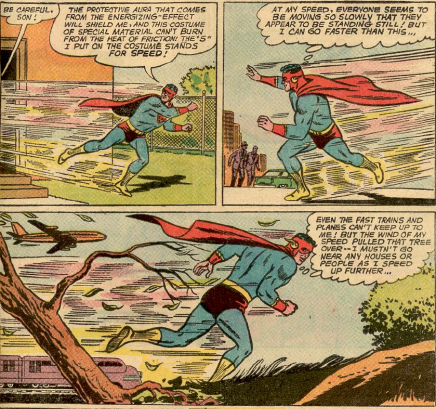 But as a Superman compendium, it works. 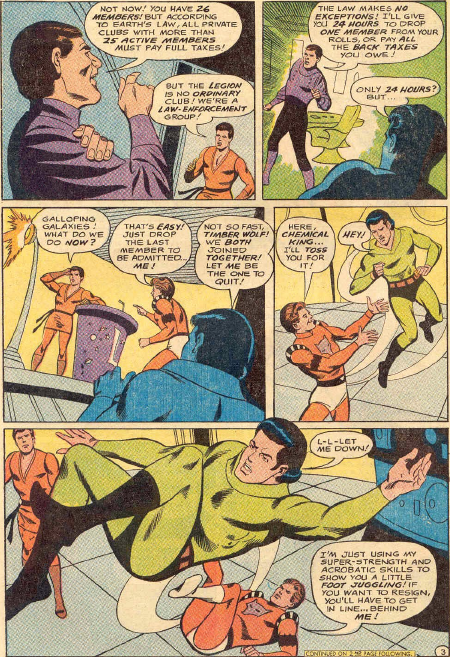 Jim Shooter introduces a new villain, and tries to introduce a new supporting character, in Action 378 (July 1969), with art by Swan and Abel. 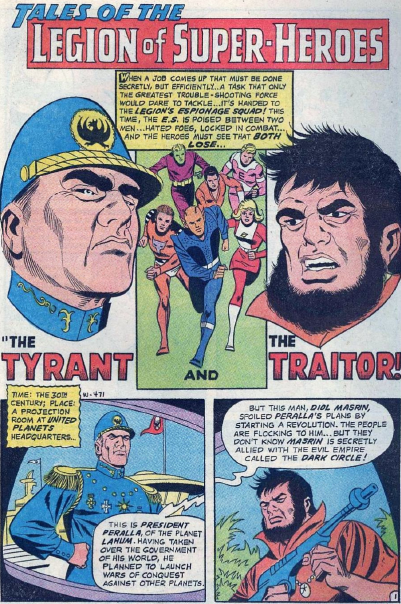 An alien travelling towards Earth gets captured by another alien, who calls himself the Marauder. 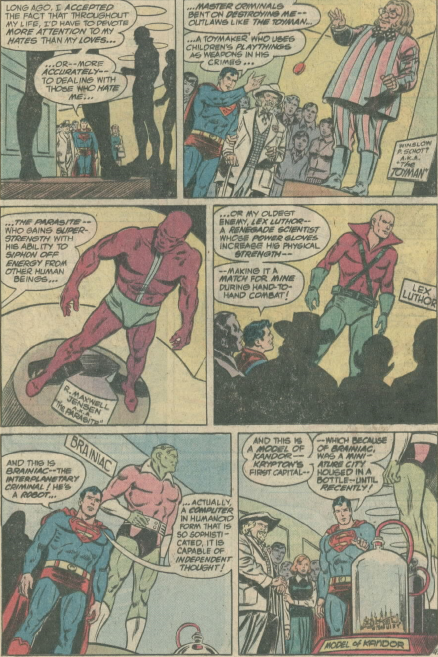 The Marauder wants vengeance against Superman, for some previous defeat, though this is the first time we have seen this villain. 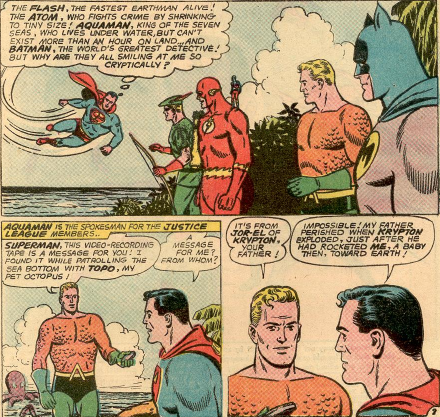 He brainwashes the alien into believing that he is the Devil, and gives him a trident with kryptonite. 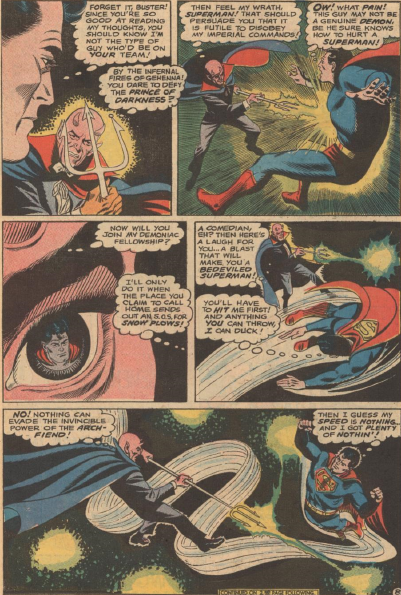 The character seems supernatural when he attacks Superman, though the kryptonite gives the game away to some degree. 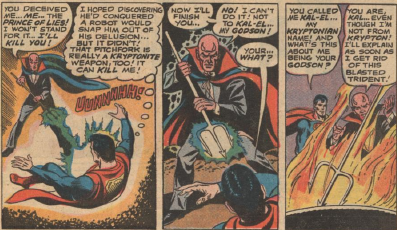 Superman tries and fails to break the “devil’s” programming, but fails at that. 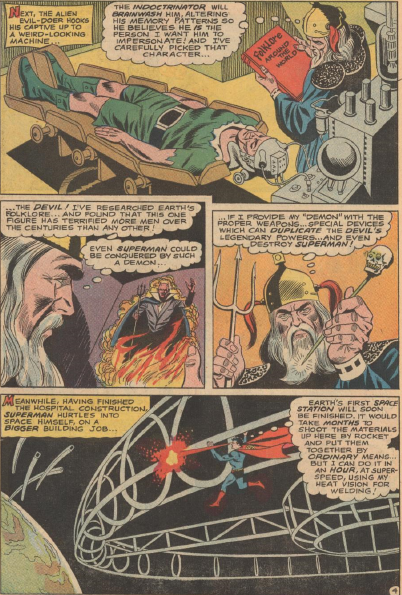 To his good fortune, as the “devil” moves in for the kill, his own mind takes control. 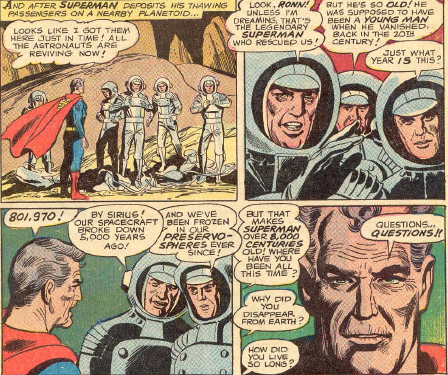 He is, in reality, Superman’s godfather, having visited Krypton shortly before it exploded, and made friends with Jor-El. It’s funny that the end of the story insists that this character, Rol-Nac, will return soon, and be a new regular supporting character. 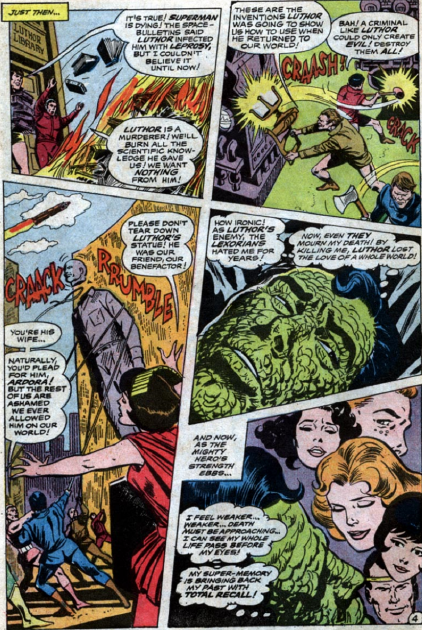 He never appears again, but the Marauder, so forgettable in this tale, does come back in the early 70s. 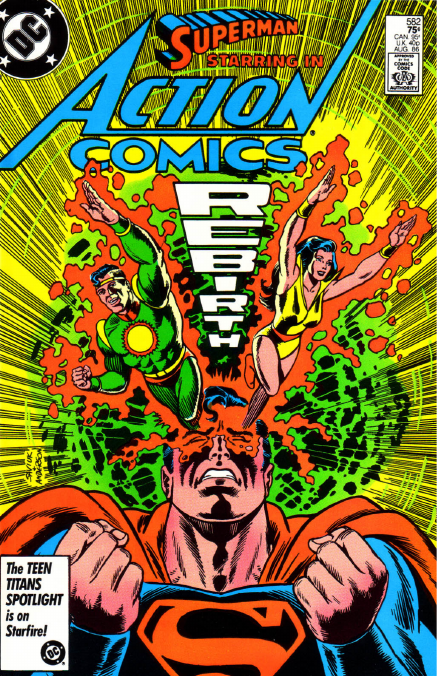 Jim Shooter also pens the Legion of Super-Heroes story, with art by Win Mortimer and Mike Esposito, as the super-team begin their run in this book. 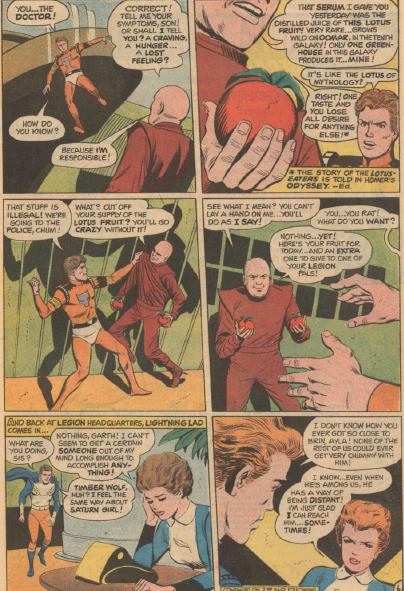 While none of the Legion stories from this period in Action would be considered great stories, one has to credit how well the strip handled the savage decrease of pages. 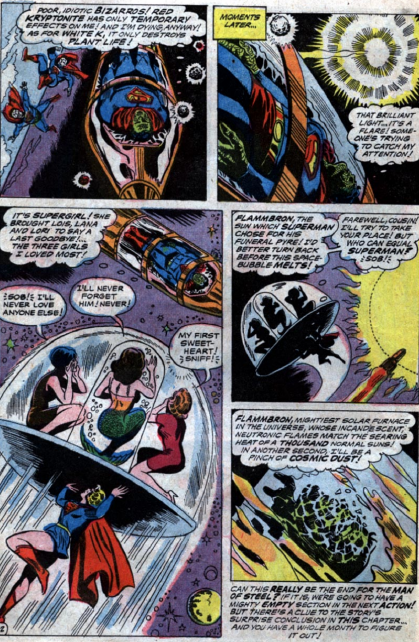 Instead of large, cosmic adventures with the bulk of the team, the stories now would often focus on only a few of the Legionnaires, and on smaller, more personal events. 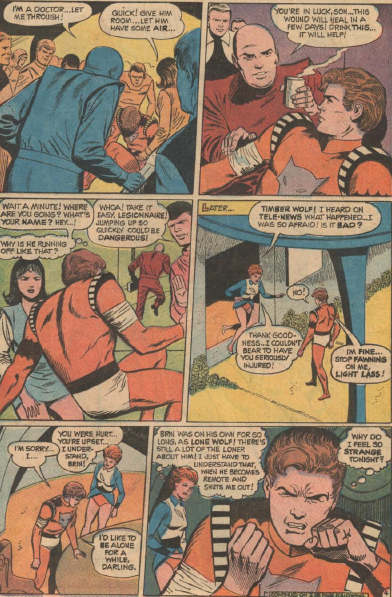 This story stars Timber Wolf and Light Lass, and gives Brin Londo a sort of drug addiction, although it’s to a lotus fruit. His addiction is messing up his hero-ing, as well as his relationship with Light Lass. She figures out the root of the problem, and tries to talk to Brin about it, but he just pushes her away. 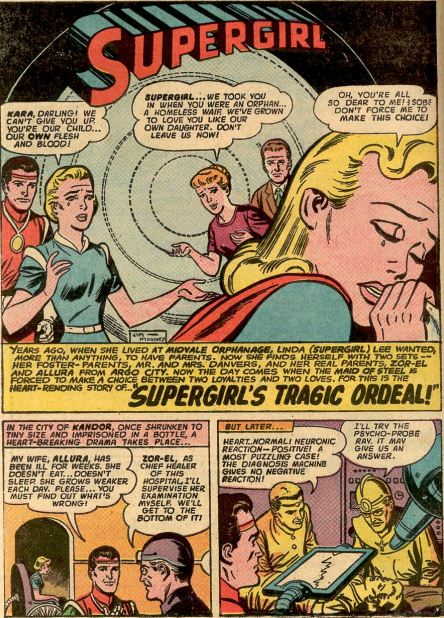 Lightning Lad has a cameo, as Ayla opens up to her twin about her concerns. 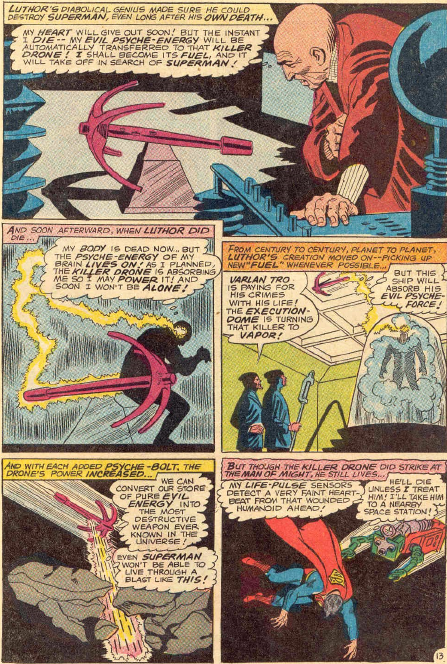 We see that the lotus plant gives Timber Wolf some hallucinatory effects, though the art team doesn’t make it look particularly exciting. Light Lass forces Brin to choose between her and the lotus plant, and although his addiction makes him struggle, he does pick Light Lass. 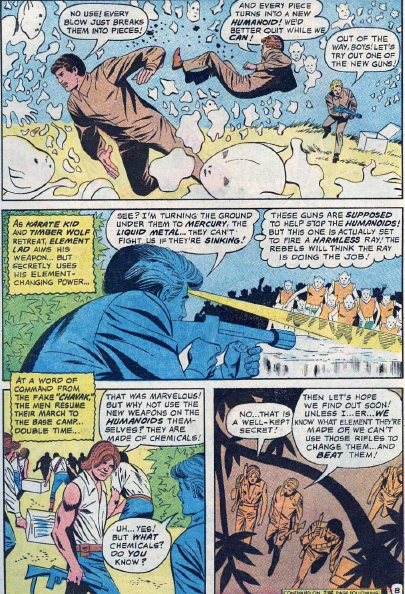 While this story is never directly referred to, later tales would make reference to Light Lass devoting a lot of time and energy to Timber Wolf’s problems. 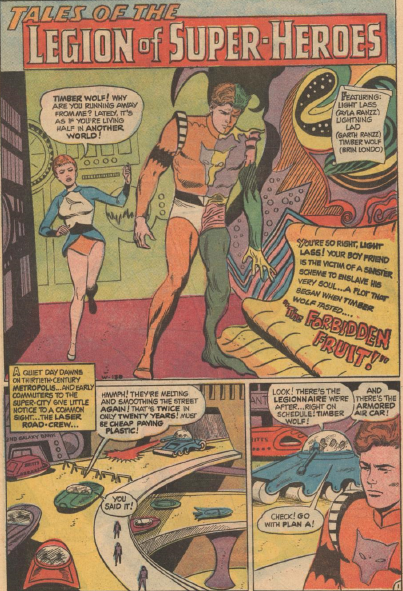 Action 365 (July 1968) contains the penultimate chapter of Dorfman, Andru and Esposito’s Virus X saga. Sadly, there is little that actually happens in this issue. 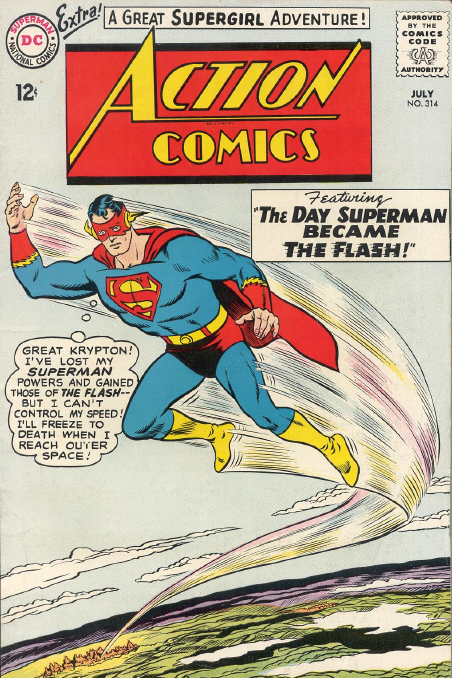 It begins by recapping the story so far, and then turns into a reviewof Superman’s life, as it all passes through his mind as he travels through space. 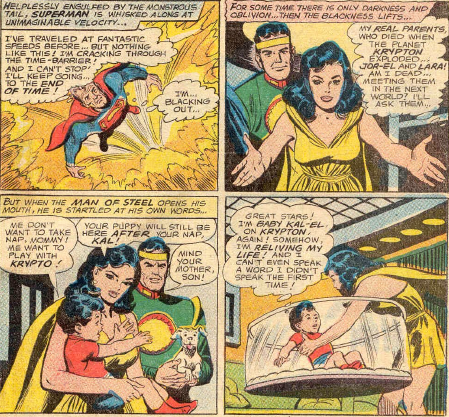 We get Jor-El and Lara sending him off from Krypton, and teh Kents finding and raising him. 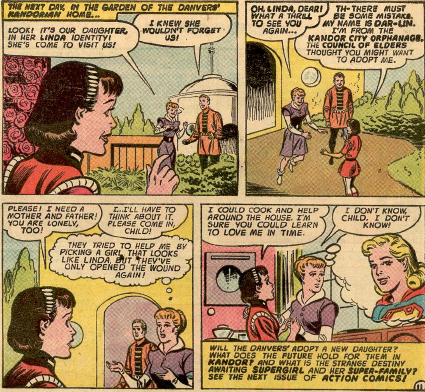 Lana Lang is introduced, and the origin of LexLuthor retold. 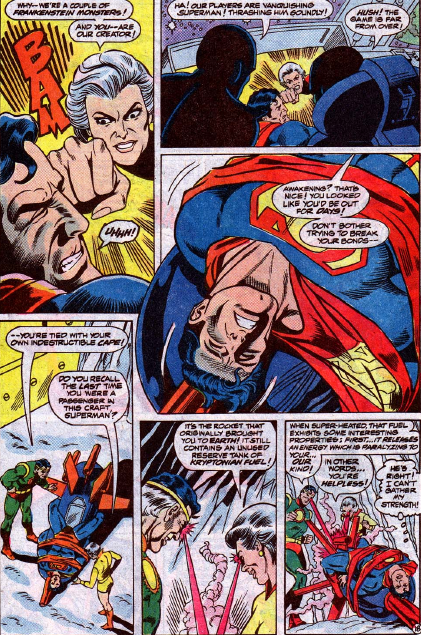 As Superman’s body passes Lexor, the people rise in revolt against Lex for killing Superman. 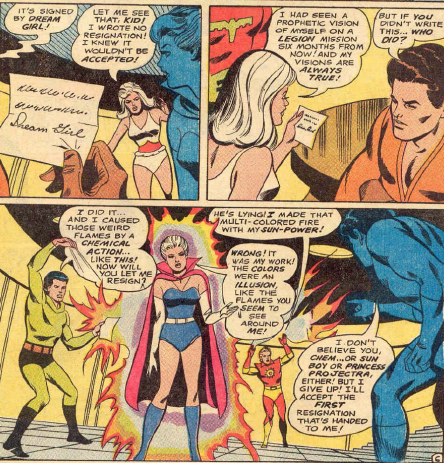 Ardora tries to get the mob to calm down, but I expect she had some rough days ahead of her. 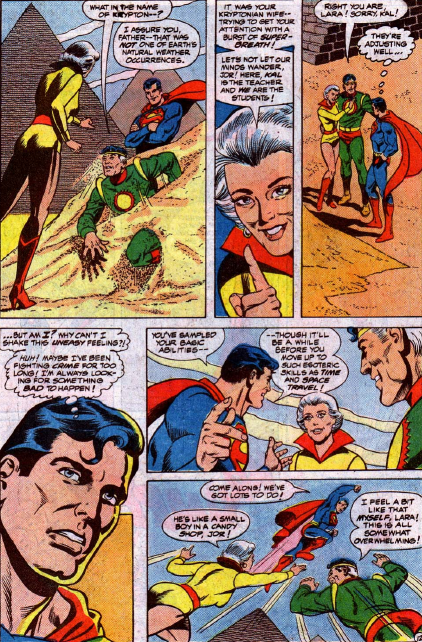 In fact, we do not see Ardora again until the 80s, although Lexor appears in World’s Finest tale in the mid-70s. 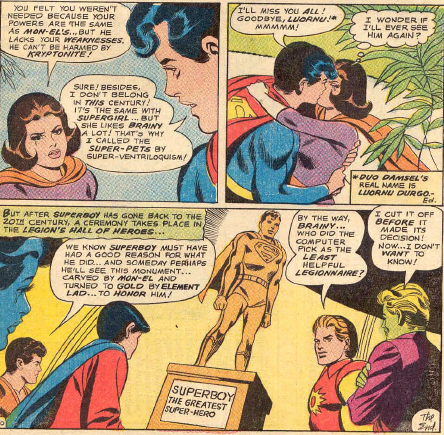 Superman recalls his time with the Legion of Super-Heroes, and later Batman and Robin, and the Justice League. 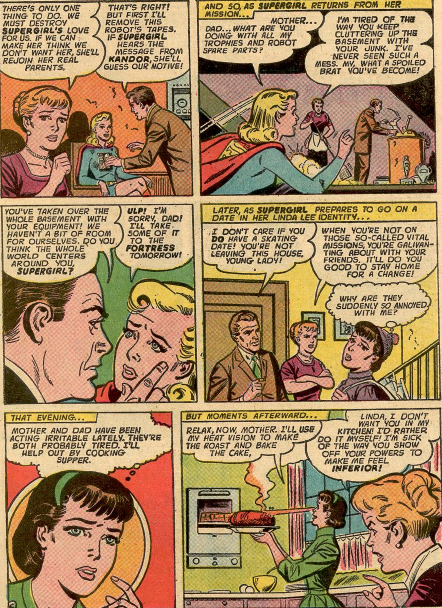 Lori Lemaris, and then his time at the Daily Planet, with Perry White, Jimmy Olsen, and Lois Lane. 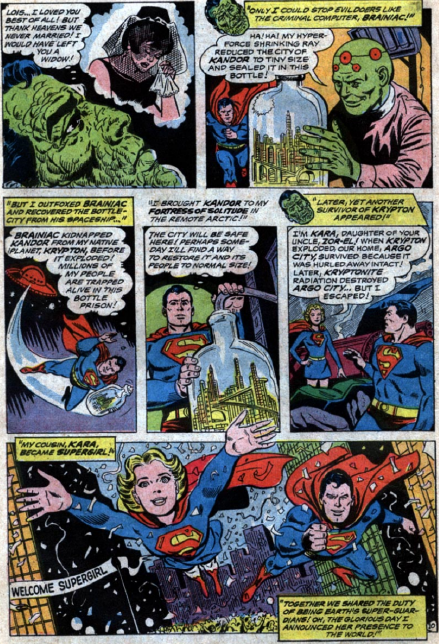 Brainiac, Kandor and Supergirl get a page devoted to their tale. 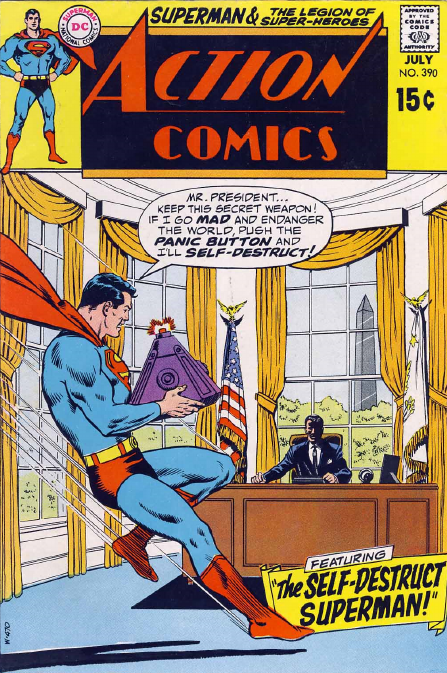 He passes Bizarro World, and they shower him with all the forms of kryptonite. 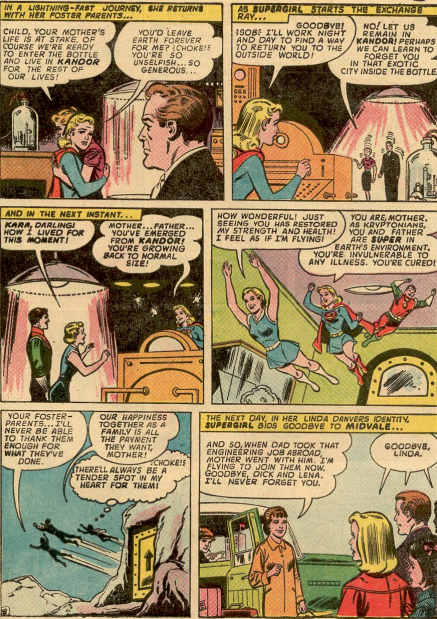 Just before he plunges into the heart of a star, Supergirl flies out Lois, Lana and Lori, to watch and mourn.